Today in our countdown, we introduce you to the #7 team of all time – the 1986-1987 Edmonton Oilers. This is the first team that we’ve seen from the 80’s Oilers dynasty as I’ve tried to limit my selections to no more than 2 teams from the same dynasty. Since the Oilers joined the NHL in 1979, they had won championships in 1983-1984, 1984-1985 and this was the 3rd championship for them. And boy was this 3rd championship team a scary one. The early part of the decade was a bit heartbreaking for Oilers. The NHL at the time had only 21 teams, but 16 teams made the playoffs so the Oilers got plenty of playoff experience. However, when they first joined the NHL, they really only had Wayne Gretzky and were short on talent. But over the next 3 years, the Oilers put together one of the most impressive displays of drafting, drafting Mark Messier, Glenn Anderson, Jari Kurri, Paul Coffey, Kevin Lowe, Grant Fuhr, and Andy Moog. 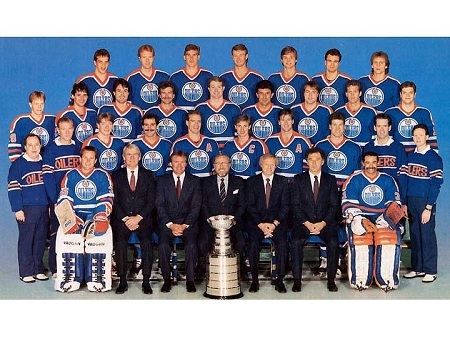 1983-1984 and 1984-1985 saw the Oilers win back to back championships and finally wrestle away dominance of the NHL from the New York Islanders who had taken the first 4 championships of the decade. In their quest for a three-peat, the Oilers were denied by their division rivals the, Calgary Flames, in the 2nd round, despite having 3 50-goal scorers. This was a particularly heartbreaking loss as it’s known as the Steve Smith loss. In the third period of a 2-2 Game 7, Oilers defenseman Steve Smith accidentally put the puck into his own net and it ended up standing as the series-winning goal. Bummed by the loss, the Oilers came back even stronger in 1986-1987 and thus we have our #7 team of all time. The Oilers came out of the gate a bit slow, posting a 4-4 record through their first 8 games. The Oilers turned things around at the end of October, winning the last 4 games of the month to vault them to an 8-4 record and into first place in the Campbell Conference. November was a different story for the Oilers, as they went 6-6-1 and fell to just 4-8 on the road thus far in the season. The month wasn’t too bad though as the Oilers remained in 2nd place in the conference despite owning just a 14-10-1 record. However the month did have one bright spot as Gretzky recorded his 500th goal in a 5-2 win over the Canucks. Most though were starting to have questions about the Oilers. Despite having guys like Gretzky, Kurri, and Anderson, all of whom were coming off of 50 goal seasons, the Oilers still weren’t winning at the same pace as the previous three years. All questions would be put to rest over the next 2 months as the Oilers went an impressive 20-4-3 to blow the conference wide open. By February 1st, the Oilers were an impressive 34-14-4 and held an 11 point lead in the Conference and a 14 point lead in their division. The Oilers improved all across the board. After the first two months, the Oilers were struggling both offensively and defensively by their standards. In 85-86, the Oilers scored 5.3 goals a game, an astonishing number. However, through the first 2 months of the season, the Oilers were down to just 4.4 goals, and to make matters worse, the Oilers were giving up 3.83 goals a game. Their next two months saw dramatic improvements on both sides of the puck, as the Oilers averaged 4.93 goals for and just 3.03 goals against over those two months. Their goal differential went from a meager 0.57 to an incredible 1.90. All good things must come to an end though. The Oilers started February hot, pushing their record to 37-15-5. The first few games of February also saw Gretzky record his 50th goal of the season (done in 55 games), but that was the end of the good news for the Oilers. The Oilers reached the All Star Break that year, but instead of the All Star game, the Rendez-vous of 1987 took place, which was a two game series between the NHL All Stars and the Soviet Union. The Oilers had a league high 7 players on the NHL All Star Team (Paul Coffey – injured DNP, Glenn Anderson, Mark Messier, Esa Tikkanen, Jari Kurri, Grant Fuhr, and Wayne Gretzky), and there is a possibility that the extra hockey took something out of the Oilers. After the break the Oilers proceeded to drop 5 of their next 6 games, and let their conference lead drop from 12 to 5 and their divisional lead drop from 17 to 5. The Oilers had enough of their losing ways and went on a tear to start the month of March, winning their first 7 games by a 44-22 margin (6.29-3.14 average). The Oilers finished out the season witha 5-4-1 record, but still finished with the best record in the league. The Oilers final record was 50-24-6 for 106 points and their 2nd consecutive President’s Trophy. Their first round opponent? The Los Angeles Kings. Before we talk about the Kings, we have to look at the Oilers goaltending situation as it was one of the most unique of all our NHL Champions. The Oilers did have a big question heading in to the playoffs – who would they ride in goal? Both Andy Moog and Grant Fuhr had been strong for the Oilers in the regular season, with Moog earning 6 more wins, but Fuhr having the lower GAA. The Oilers decided to continue the time share in goal initially. The Oilers went 4-2-2 against the Kings, including taking 3 of the last 4 by a 25-13 margin. The last game of the season was a 7-3 victory by the Oilers and it gave the team a head of steam heading in to the playoffs. However, the Kings surprised the Oilers, taking Game 1 5-2 on the road. The Kings were led by their All Star Luc Robitaille and also received sizable contributions from Bernie Nicholls, Jimmy Carson, and Marcel Dionne. Faced by the prospects of possibly going down 2-0 heading back to Los Angeles, the Oilers put on one of the most impressive offensive displays in NHL history, trouncing the Kings 13-3 in Game 2. Yes, that’s not a typo. The Oilers were led by their stars as Gretzky had a 7 point night (1 goal, 6 assists) and Kurri had a 5 point night (4 goals, 1 assist). What was most impressive about this night was that the Oilers scored those 13 goals on 45 shots (28.9% shooting percentage), and held the Kings to just 14 shots on goal. Yes you read that correctly. The Oilers scored 13 goals, while the Kings only had 14 shots. This loss absolutely demoralized the Kings, and the Oilers poured in another 17 goals over the next 3 games to put away the Kings in 5. The Oilers scored 32 goals in 5 games. If you haven’t figured it out by now, this team could score and score aplenty. During this final stretch of the first round, the Oilers tabbed Fuhr to be the goalie and he got the nod the rest of the way. Awaiting the Oilers in round 2 were the Winnipeg Jets who finished 3rd in the Conference. The Jets were led up front by Paul MacLean and Dale Hawerchuk. The Jets took care of the Oilers dirty work, knocking out the Calgary Flames in 6 games. The regular season series was hotly contested between the two teams, as the Oilers won the season series 5-3, but only outscored the Jets by 6 goals over those 8 games. However, the Oilers had won their last 3 games to put away the Kings and were on an absolute tear. The Jets put up a tough fight in Game 1, but lost in OT 3-2 when Glenn Anderson tallied his 2nd goal of the game just 36 seconds into overtime. The Oilers again controlled play, outshooting the Jets 30-16, but the Jets did play them close as they had all year long. Game 2 saw the Jets play even better, as they were able to put 30 shots on goal and hang with the Oilers offensively. However, the Oilers got a major contribution from one of their role players, defenseman Charlie Huddy. After scoring only 4 goals and 19 points in the regular season, Huddy chipped in 2 goals and an assist to lead the Oilers to a 5-3 Game 2 win. Heading back to Winnipeg, the Jets play picked up even more, as they carried the play, outshooting the Oilers 37-25. This marked the first time all playoffs that the Oilers were held under 30 shots. The only problem for the Jets? The big boys for the Oilers finally woke up. Through the first two games, Gretzky had been held to just 2 assists, Kurri to 0 points, and Messier to just 2 assists. Game 3 was a new story as Kurri scored twice, Gretzky recorded 3 assists, and Messier recorded a goal and an assist. Game 3 was demoralizing for the Jets as they had controlled the play, but still lost 5-2, the biggest margin of victory in the series. The Oilers smelled blood in Game 4 and scored 3 goals in the first 14 minutes of the 1st period and cruised to a 4-2 win, their 8th victory in a row. The Conference Finals had the Detroit Red Wings awaiting. The Wings really had no place being in the Conference Finals, as they finished 5th in the conference, had a losing record (34-36-10), and were last in goals for. However, the Wings were led by their young captain Steve Yzerman, who had recorded 13 points through the first two rounds. The Wings though were not equipped to matchup with the Oilers. The Oilers went 3-0 against the Wings in the regular season, outscoring the Wings 15-9. However, just when you think things aren’t going to work, you get surprised. The Wings shocked the Oilers in Game 1, In a penalty filled game, the Wings won 3-1, thanks to Yzerman’s 2 point night (1 G, 1 A). The Wings though awoke the beast. Mark Messier over the next 4 games, led the team, scoring 4 goals to lead his team to victory in each of the next 4 games. Game 5 saw the Wings jump out to a 3-1 lead midway through the 2nd period, before the Oilers switched into a gear and scored 5 goals to put away the Wings 6-3. In the Stanley Cup Finals were the Philadelphia Flyers. The Flyers were the #1 team in the Wales Conference, finishing 46-26-8 for 100 points. The Flyers were a strong team, being top 5 in both goals for and goals against. The Flyers were led by a committee of scoring, as they had 8 players with 49 points or more, led by Tim Kerr who had 95. In goal was Ron Hextall who was the Vezina Trophy winner that year. The Oilers knew the challenge they had as this was a rematch of the 1985 Finals. The Flyers also won the regular season series 2-1, outscoring the Oilers 11-9 in case the Oilers needed any reminder of how much of a challenge this would be. Game 1 saw a bruising 40 minutes end in a 1-1 tie with the game up for grabs. The Oilers big guns took the bait as Anderson, Coffey, and Kurri all tallied for the Oilers in the 3rd period as they put away the game 4-2. Game 2 had a similar storyline, except that Philadelphia led 2-1 after 40 minutes. However, Philly got a little sloppy in the 3rd and allowed Anderson to tie the game with his 12th of the playoffs. In OT, Philly, a team that prides itself on strong defensive play, again got burned on a defensive mistake, leaving Kurri alone to bury the game winner with 3:30 remaining in the 1st OT. This was the Oilers 6th consecutive win and it looked like Philly was in trouble. Game 3 saw the Oilers jump on the Flyers very quickly as they opened a 3-0 lead just 22 minutes into the game. Things looked really bleak for the Flyers, but they dug deep and scored 5 unanswered goals to take Game 3 by a 5-3 score. This was the first time in NHL History that a team came from behind when trailing 3-0 to win a game. Looking to take the momentum into Game 4, Philly wanted a strong start. Unfortunately, Gretzky, winner of his 8th consecutive Hart Trophy and his 7th consecutive Art Ross this season, decided to take matters into his own hands. Gretzky recorded 3 assists to lead the Oilers to a 4-1 victory. However, the major play of this game was a vicious Ron Hextall slash to the back of Kent Nilsson’s legs which led to Hextall being suspended for the 1st 8 games of the following season even though Nilsson was uninjured. Hextall was allowed to continue for the remainder of the series though. Heading back to Edmonton, the Oilers looked to close out the Flyers and clinch their 3rd Stanley Cup in 4 years. The Oilers jumped quickly, beating Hextall twice in the first 6:39 of the game. However in the final minute of the 1st period, Flyers forward Rick Tocchet tallied to give the Flyers some life heading into the 2nd. At the end of the 2nd, the game was tied 3-3. In the 3rd, Rick Tocchet finished what he started, scoring again to lead the Flyers to a 4-3 win, spoiling the Oilers parade. Game 6 was back in Philly and once again Edmonton was determined to put away the Flyers early. After the first period, the Oilers led 2-0, but you knew Philly wasn’t going away that easy. The Flyers slowly chipped away, scoring once in the 2nd period, before scoring 2 goals in a 34 second span in the 3rd period to rally yet again. Hextall was marvelous, stopping 30 of 32 shots and keeping his team in it long enough for them to rally. Game 7 was back in Edmonton and this one featured a strange twist. In all 6 games of the series, the Oilers had scored first. This time, the Flyers scored first, just 1:41 into the game and panic spread through Oiler nation. However, Mark Messier came back 6 minutes later to tie the game. The game remained tied through the middle of the 2nd period, while Edmonton kept coming in waves. Kurri finally beat Hextall with 5 minutes remaining in the 2nd to put the Oilers up 2-1. Through two periods, the Oilers had outshot the Flyers 31-18, but still only had a 1 goal lead to show for it. In the decisive 3rd period, the Oilers turned the defense up another notch, allowing just 2 shots on goal and added the insurance marker with 2:24 to go. The Stanley Cup was heading back to Edmonton. So that’s the story of the 1986-1987 Edmonton Oilers. What separated this team from other teams in history was their offense. It simply was the greatest offense the NHL has ever seen. Gretzky, Kurri, Messier, and Anderson scored the goals. On defense, Paul Coffey was making people think he was the 2nd coming of Bobby Orr with his offensive rushes. Esa Tikkanen put up one of the best seasons of his career, scoring 34 goals and tallying 78 points. the Oilers had an amazing 3 players finish with 107 or more points, and 6 players finish with 67 or more points. This team would simply run you out of the building. What separates this team from the other Oilers teams (save 1, we’ll get to them later), was that they had the ability to play timely defense when it was needed. In Game 7, the decisive period of the Stanley Cup Finals, they only gave up 2 shots on goal. When they had to, Grant Fuhr and Andy Moog got the job done, and in the playoffs it was all about Grant Fuhr. This team was fantastic offensively, good when they needed to be defensively, and thus they are the #7 team of all time.